BIGFOOT: TO KILL OR TO FILM? Strasenburgh: As for the morality of it, to kill an animal (to me, man is an animal) is only to shorten its life. Bayanov: What the hell is this euphemism for? You haven't yet given enough thought to the matter. Strasenburgh: What earthly difference is there between death at the hands of a lucky hunter and at the hands of a (probably intoxicated) logging truck driver? Are accidental deaths unnatural? My preference for a deliberate killing springs from my belief that no living thing can hope for more than a dignified end to his time on this earth. A 'chance encounter’ with an adequately armed man, a motor vehicle, or old age, for that matter, is neither dignified nor, to use George's word, compassionate. Death at the hands of a hunter who sets out to kill an individual, on the other hand, at least might be compassionate. Bayanov: Unless Gordon (being, I understand, by his own definition, an animal), doesn't mind being killed by someone out of compassion to prevent his possible painful death in an accident or the troubles of old age, or answering the demands of some 'ologists,' his argument doesn't hold water whatsoever. If he hasn't got such a suicidal bent and wishes to go on living, he is well advised to surmise that other creatures may also want to live. It is to honor this wish and its ramifications for fellow living creatures that morality is about. And one practical asset of morality as against immorality is that it brings about a widely shared sense of security and relative justice in place of insecurity caused by arbitrariness. Let nobody think that by stressing the moral side of the problem I am laying some special claims in this respect. I am as good a sinner as anybody. But in this particular case, for a change, I find it simply difficult not to be virtuous. I mean normal people are usually pushed to sin not so much by their own will as by the pressure of circumstances. Ours is a rare, perhaps unique, situation wherein we are not really pressed by the circumstances; wherein the circumstances, no matter to what small degree, may depend on us, on our statements, ideas, and actions. Can't we afford to be virtuous if the virtue in question is no more expensive to us than politeness? Strasenburgh: Lorenz's argument about "rising levels of organization" is a rehash of the long-standing European conceit that man is God's glorious capstone to a systematic creation. If he really had something to say, he would not have compared "chopping up a live dog and a live lettuce!" People in the Far East consider dogs very tasty. Monkeys in South America and gibbons in Asia are eaten. And in New Guinea humans are (or until very recently were) eaten. Bayanov: Now about Gordon's jibe at Lorenz. To me the latter's words are not a rehash of anything, but a statement of an empirical fact, confirmed in our case by John Green who says he doesn't kill anything bigger than mosquitoes. What about you, Gordon? Can you really chop up a live cat as easily as a live lettuce? (Aside: I happen to know from his letters that Gordon is a cat man, not a dog man like me.) If yes, I am afraid, you are an exception dealt with by Lorenz in the last sentence of that passage. As for the fact that people in some lands eat anything, including other people, it has nothing to do with Lorenz's statement. You would be right only if you could prove that a cannibal, chopping up a live man for dinner, does it as nonchalantly as when he cuts vegetables. Strasenburgh: If I want a salad I will chop up a lettuce, and if I am bent on answering the demands of the anthropologists, I will kill a homi and present them with a specimen. One action is as purposeful as the other. Bayanov: What's that awful thing about justifying any action if it has a purpose? To take an extreme example, the Nazis' gas chambers were as purposeful as anything, but could there be anything more horrendous? Strasenburgh: Without boring you with an involved explanation of how I arrived at my conclusion, my feeling is that if there is a need for a specimen, then I would prefer to have an individual deliberately shot and killed. Bayanov: The question arises, whose word for the existence of such a bloody need must we heed? The word of God, of John, of René, or of the anthropological community in whose collective skull Gordon invites us to bury our hatchets? So far neither John, nor René, nor Gordon have convinced me of the existence of such a need for human society. There is also this argument: either we sacrifice one hominoid and save the rest of the species, or we lose the whole damned lot of them. If true, it would be a really serious and valid proposition. If we had to choose between specimen and species there is little doubt what the outcome of the vote would be. But I hope there is no such alternative for the time being. And I'm glad my opponents in the argument over the ocean agree that our 'wards' are in no immediate danger of extinction. I do hope we shall make science accept their existence, with methods which don't go against the grain, before the creatures reach the point of no return due to their dwindling numbers. Strasenburgh: Of all human tendencies, that of establishing our species as a standard against which all living things are to be judged and valued is the most distasteful to me. "We are, in my opinion, on the verge of extinction. If our species is to save itself and our world, some rather drastic changes in our attitudes have to occur. I would hope that the shock and the wonder of discovery of the homi could be turned toward changing certain attitudes. (Now perhaps you will begin to see why I object even to the suggestion that anything 'places man on top' of anything.) No one can doubt that we are a very powerful species. But can we control the power we wield? If we cannot, then our 'power' is a negative force, not a positive one!" Can we control the power we wield? Which at an individual's level may be the power of a hunting rifle. Don't you see, Gordon, that your question is of direct relevance to the problem? And that your other pronouncements contradict what you so well stated last year? Also that your position as stated in the above passage is very close to, if not identical with mine? Dahinden: Scientists say they don't want any footprints, photographs or movies but the creature itself, living or dead. Bayanov: Strangely enough, this is interpreted by René as a license from science to shoot a Sasquatch and, judging by his oft-repeated mention of it, is his strongest argument. In my opinion, René, it's one of your weakest arguments. First of all, your relations with the scientific establishment have been so far of the kind which doesn't make your leaning on them, when it suits you, very convincing. One can't denounce someone's attitude in one sentence and use it as a positive argument in another. If the anonymous scientists René refers to did not display the same attitude and were really eager to help us with their considered advice, then let them speak up and give their reasons, let them state in public their approval of homi killing. Neither of us has any illusions about the profession. Scientists are only human, and their opinions can only be of more value than that of the man in the street when it is supported by a detailed scientific analysis. René tells me that whether he shoots a Sasquatch or not will depend on whether the latter behaves or not when they happen to meet. Do you expect, René, the giant to pose obligingly for a snapshot or let you smilingly hand-cuff him to earn his life? The trouble is, René, that even if you become the victim of an unprovoked attack by the creatures and kill one of them while defending your own life, there's little chance the public will believe your story after what you've said so many times. We all expect a lot of good to ensue from our research, while a wantonly killed homi would be nothing but a terrible nasty fly in the ointment, or, as the Russians say, a spoonful of tar in a barrelful of honey. If my arguments are found to be well reasoned out and valid, I expect them to be accepted by all the parties concerned. The only force to be resorted to, said an eminent and "heretical" Russian biologist, Alexander Lubischev, is the force of reason, and the force of reason is no violence. And if these arguments are accepted, I expect all of us hominologists to agree on the "rules of the game" and make the agreement known to all concerned. I mean recognition of the "most favored creature" status of the relict hominoids or a self-imposed ban on homi killing as the main clause of the agreement, and a call to all concerned not to resort to shooting. I realize how difficult such a decision would be for Dahinden and Green. But still to change one's mind must be easier than change both mind and action, and thank goodness none of the hominologists has fired a single shot yet at the Sasquatch, only a volley of words at each other. It is human not only to get and keep opinions but also to change them. We all at one time thought there could be no such thing as a relict hominoid  now we know better, which shows there's nothing wrong in changing one's mind, and the process can go on as long as one lives. The only mistake so far has been that we all made up our minds individually regarding a problem which concerns us all collectively and therefore must be solved collectively. On the other hand, if Dahinden and Green or anybody else have valid counter-arguments to my points, then discussion must go on, and should I come to see their reasons are stronger than mine, I shall change my mind and accept their views and method. If we want the whole world to see reason we ought ourselves to set an example. The worst thing would be, of course, if we have neither agreement, nor valid counter-arguments to my points. Green (extracts): I don't have the slightest inclination to seek a collective solution. I agree entirely with René that the life of a Sasquatch and the life of any other animal weigh the same on the scale. I'll suggest also that in many cases, both in Asia and in North America, the public declaration against killing is merely a means of avoiding difficulties, and that a specimen would be collected without hesitation if the opportunity arose, with excuses being provided afterwards. I quite agree that the larger and more complex the organism the more trauma is involved in killing it. But in a world where humans are killed by the millions for the most inconsequential reasons, such as getting from one place to another at a higher rate of speed, or to satisfy various cravings or beliefs of other humans, I am simply not about to get worked up about a few Sasquatches. I wouldn't expect a Sasquatch to excel a chimpanzee in learning sign language. And the ability to learn sign language does not prevent chimps from being shot for various reasons. Moreover I have seen them myself in cages and also stacked in a deep freeze awaiting dissection, the latter a much more disturbing sight than the former, for some reason. As to the Sasquatch becoming a teacher of human boy and girl scouts we are farther apart in opinion than we are geographically. In my opinion the statement would be of equal validity if made concerning a bear. I agree that the fact that this is an animal does not provide any license to kill it. The decision, however, will be made by humans, and in North America the attitude towards science is such that there will be no hesitation in granting various institutions a license to collect specimens both for live study and for dissection. I have no illusions about our ability to influence mankind's attitude towards killing either animals or other men. Truly great men have been trying to achieve improvements along those lines for thousands of years, with only temporary successes. Whether or not someone kills a Sasquatch will rest as a grain of dust on the scales. The odds are overwhelmingly that the actual conclusion will be achieved by a lucky guy with a gun who has never previously contributed anything. My only wish is that he hurry up about it, and I sincerely wish Patterson and Gimlin had done so. My sole aim, therefore, is to get the message to the multitudes that if they get a chance to shoot one of these things it is important and worthwhile to do so, and in case they should succeed in doing so it is vital to come away with physical evidence of their success. From my point of view, therefore, the person who wants to hunt with a camera is no problem, but the person who publicizes his opinion that it would be wrong to shoot these things definitely is a problem - particularly since his arguments are emotionally attractive to the uninformed. In view of this handicap, I have no hesitation about appealing to those emotions that are favorable to the result I wish to see achieved, even though those are not commendable emotions. I am not trying to improve human character  at least not in this instance  I am trying to prove the existence of the Sasquatch. And both of us (Green and Dahinden - D.B.) really are very tired of this particular debate, not because of you (Bayanov) but because we have to live with it over here. And don't try to tell me all we have to do is change sides, we would then just have to argue with the people who now agree with us (which would be even tougher because they happen to be right). Bayanov (after discussing some of the above points): Those are things which demanded immediate attention and I postponed discussion of other points in John's letter because I don't want to impose too much on his time, bearing in mind his words that he and René, "really are very tired of this particular debate." I am pleased to note though that they are tired not because of me, "but because we have to live with it over here," which doesn't tally somehow with John's words, "I don't consider the price (of a killing) at all high." Well, let's give our hawks a good rest so that they don't lose their integrity fighting doves on two fronts, and if in the meantime they feel like changing sides they will be most welcome to do so without fear of attack from their present fellow hawks. I promise to take those on and show that, contrary to what is said in John's letter, they don't happen to be right. LEFT: Professor Grover Krantz playing the part of Bigfoot at Moscow Conference (Darwin Museum, October 1997) to mark the 30th Anniversary of the Bigfoot film documentary taken by Roger Patterson and Bob Gimlin. 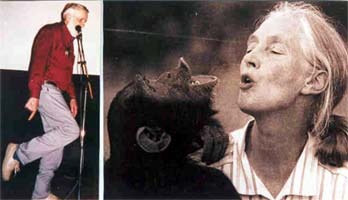 RIGHT: Jane Goodall, angel savior of nonhuman primates, greeting one of them.